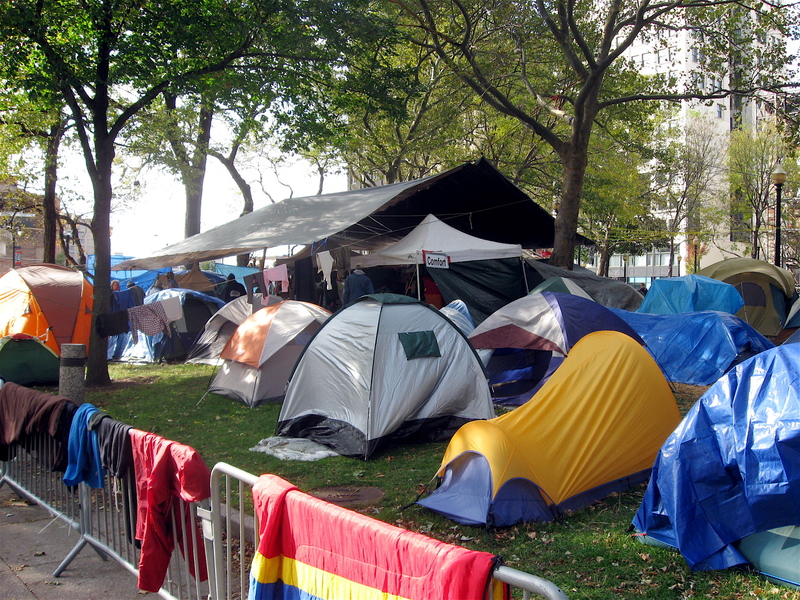 Detroit’s downtown Grand Circus Park is a campground. 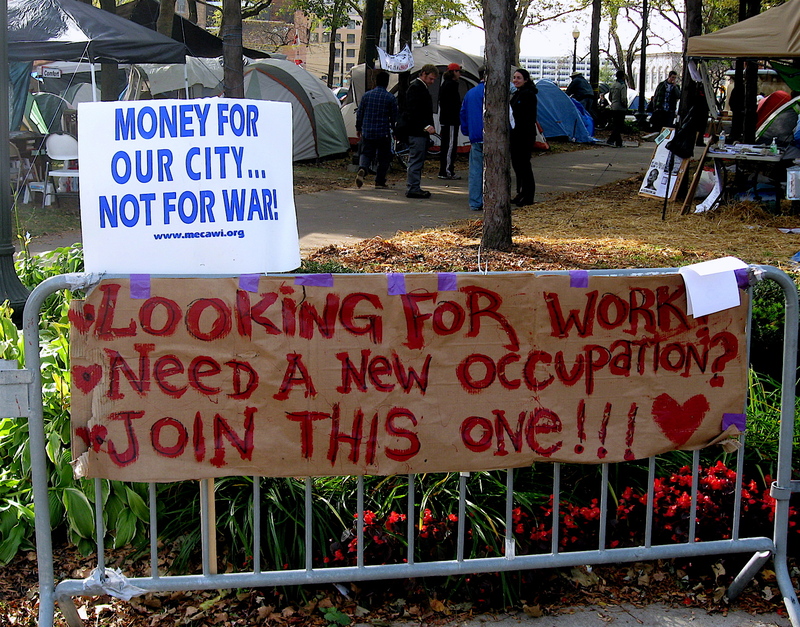 It’s the temporary campground for Occupy Detroit, a spinoff of the national protest started on Wall Street in New York City about a month ago. 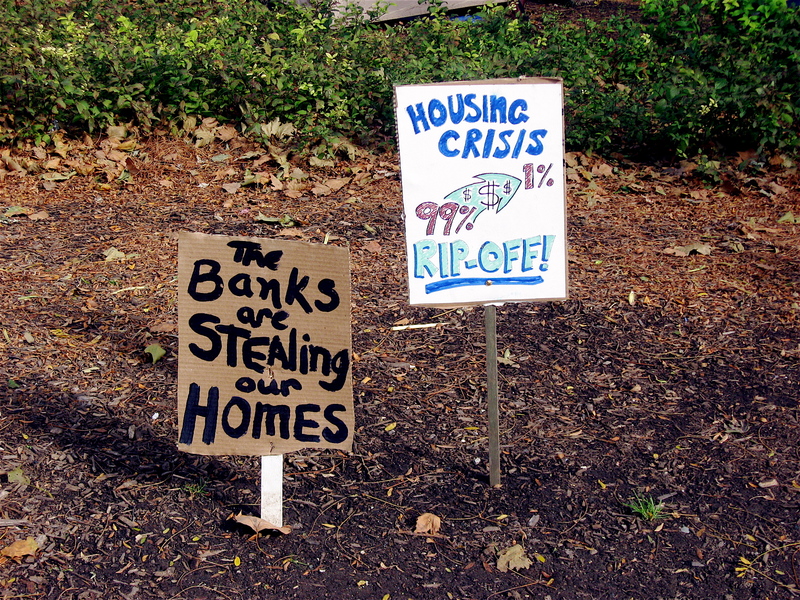 The Occupy movement is a demonstration against corporate greed, home ownership foreclosures and social injustice. 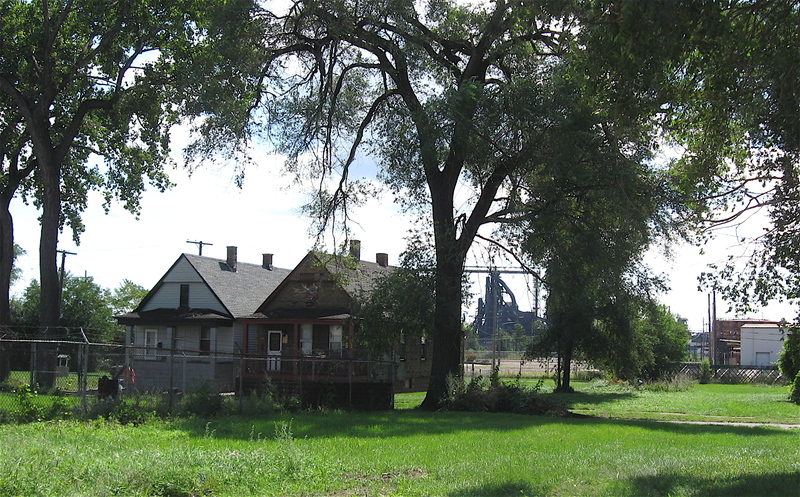 Riding my bike through Detroit’s makeshift site reminded me a state park campsite, but without the amenities. The living quarters of those camped there was tents, and there were plenty of them. All lined up like cars in a parking lot. At the small site, I saw large tarps suspended over sections of the grassy areas supported by the trees found within the park. Beneath them were information booths, a food area, latrines, and various cause-related displays. The cement walk ringing the park’s inner fountain is where activists gathered to shout out their anti-big business messages, and others pertaining to the shrinking middle class in an effort to gain attention and hopefully bring about change. 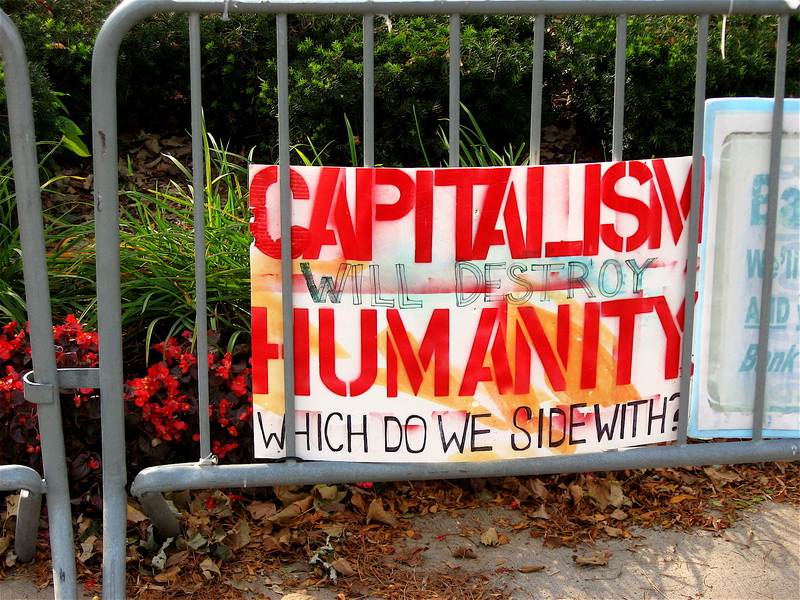 The outer perimeter of the unusual, urban camp site was lined with steel barricade, crowd control type fencing. 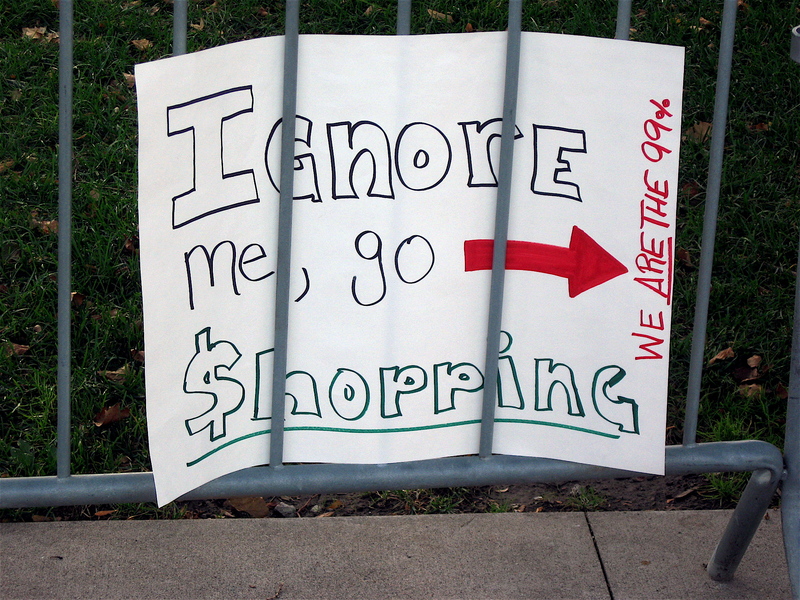 The fencing was where many of the protesters hung their anti-big business and other theme related hand-drawn signs. 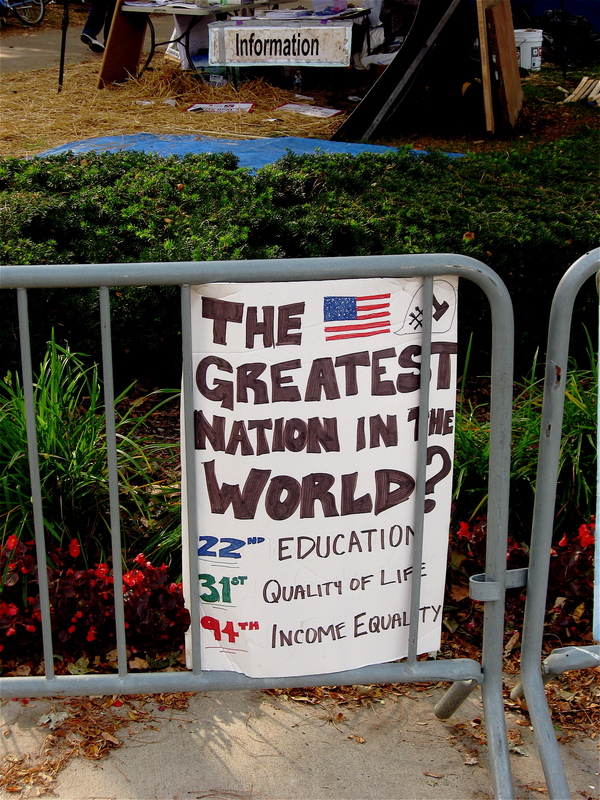 Looking at them, the underlying message seemed to be no tax breaks for the top 1% of the economic scale. 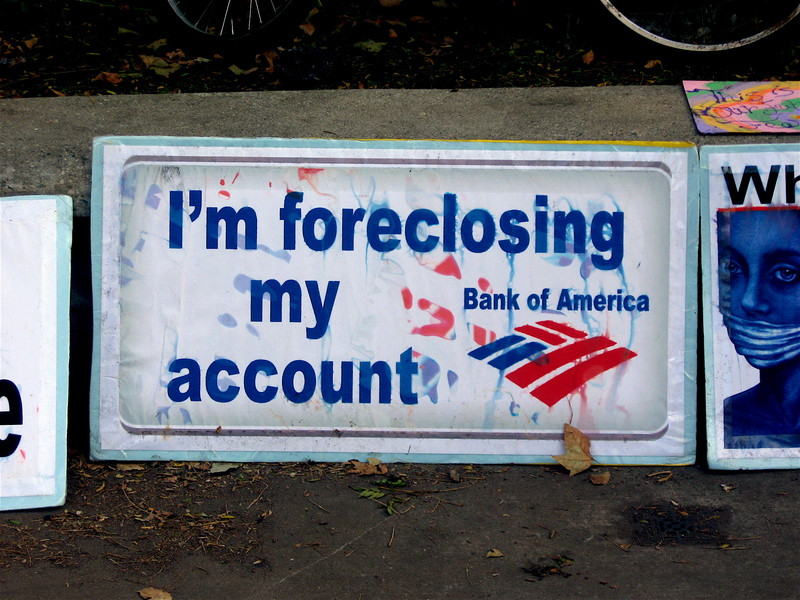 Other points included stopping the bailout of banks, a moratorium on home foreclosures, helping those that have lost their homes or having been laid off from their jobs, and other devastating economic woes facing the middle and lower classes. Pedaling through and around the park I checked out the many of the makeshift signs. 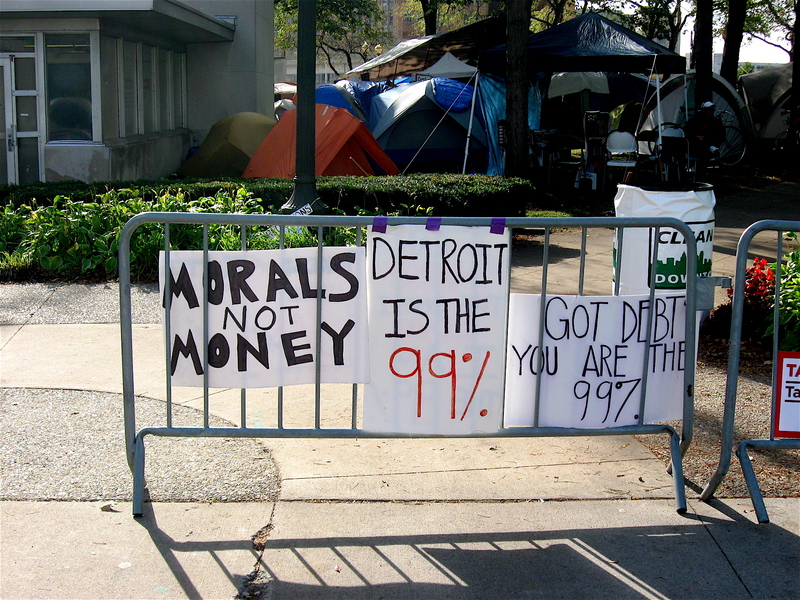 In most cases, it was clear to me that Detroit’s close-knit group of diverse, dedicated demonstrators had well-defined, targeted messages. 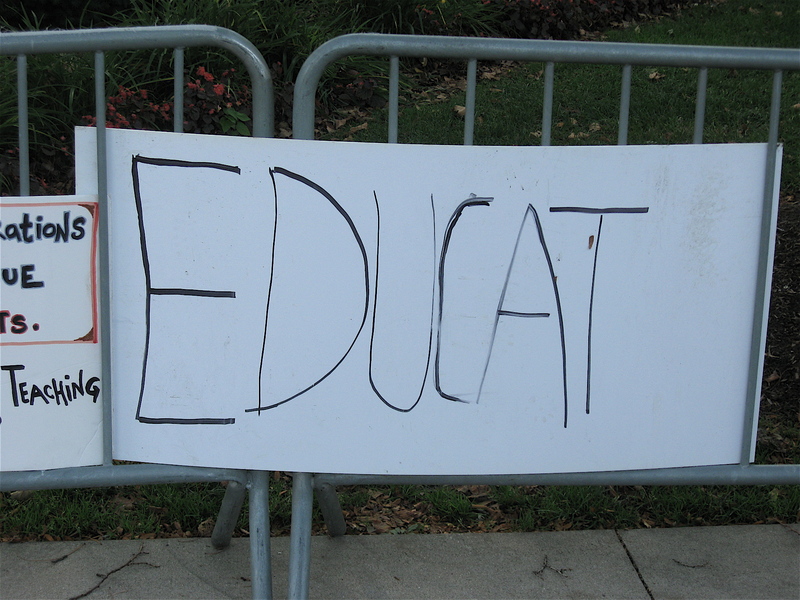 Was this misspelled by design? Those that read this blog on a regular basis know that I’m an urban bike rider. I’ve never ridden in any of Detroit’s suburbs beyond 8-mile Road. I’ve never been to the 13 area Metroparks or on any of the Michigan Trails or Greenways. It’s not that I have anything against those places; it’s just something I’ve never done. 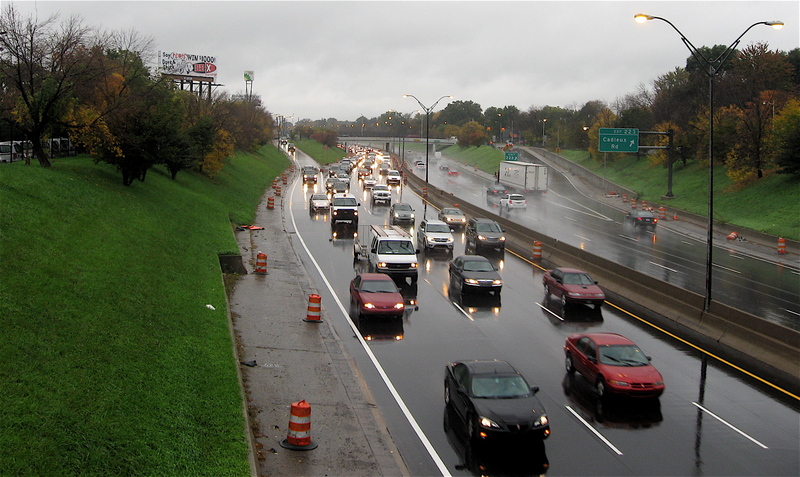 That changed a few weeks ago when I decided to commute via bicycle to work, which is a short 10-1/2 mile ride through northeast Detroit and three suburban communities. So I pulled out a map, plotted my route, and at 7 a.m. one Monday I headed out. 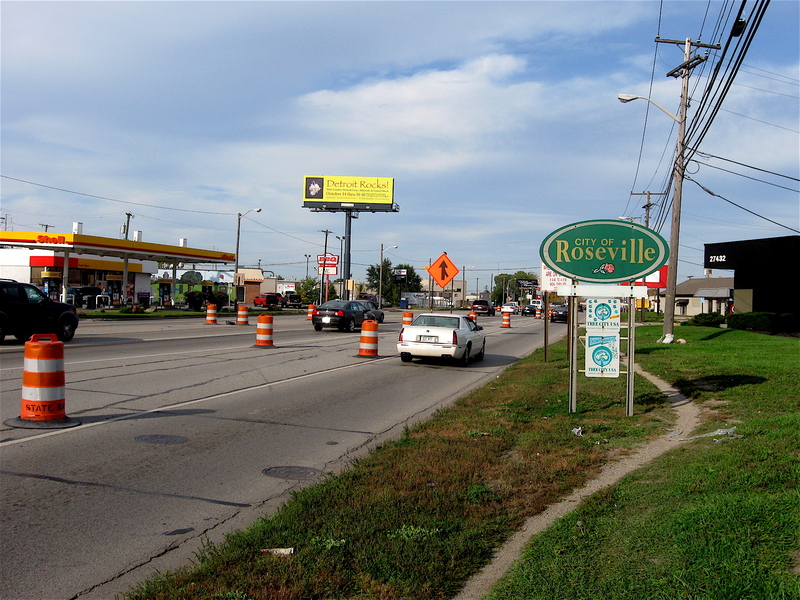 The first 4-1/2 miles or so were through the streets of Detroit to 8-mile Road, where I crossed into the first inner-ring community of Eastpointe. There, I worked my way through the grid-patterned, residential streets that are lined with modest 1950s and 60s brick ranch homes, to Gratiot Avenue, a major six lane road with a grassy boulevard. I crossed over the Avenue, headed up to Hayes Avenue, took a right and rode into the next neighboring community of Roseville. There I followed well-worn paths along non-side walked Groesbeck Highway, a major truck-laden highway packed with small manufacturing facilities. 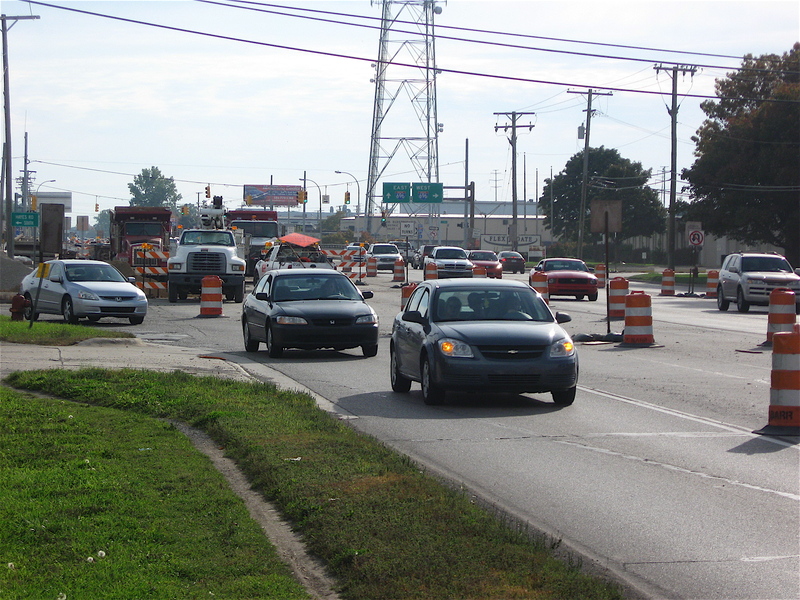 After about a half-mile of bouncing over driveway cut out curbs, muddy ruts and makeshift pavers, I crossed over the highway into the city of Warren to my office building. Riding in the suburbs three to four times per week, over a number of weeks was quite different from cycling in Detroit. 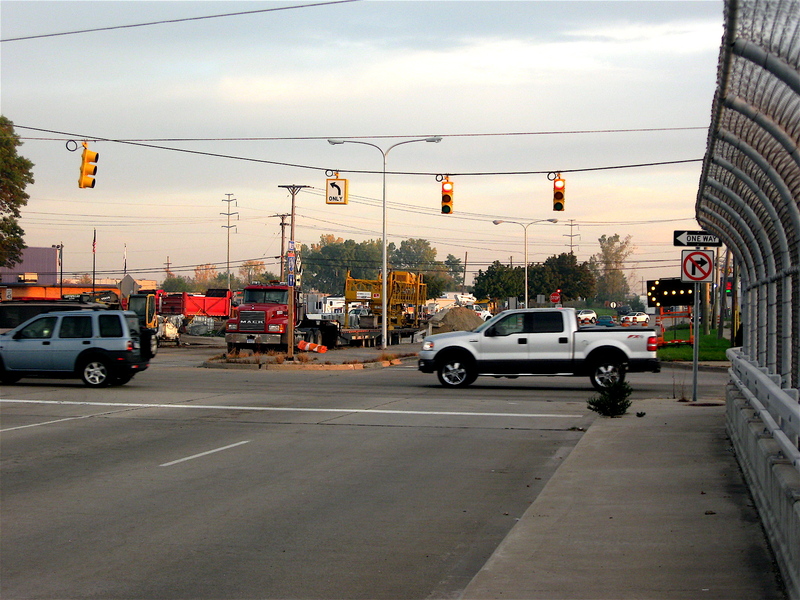 In Detroit the streets are wide, and traffic was noticeably lighter. 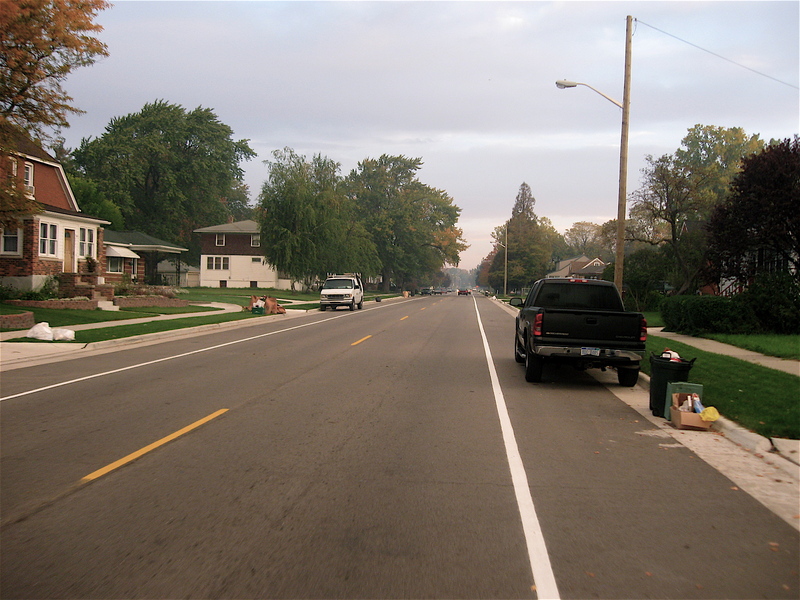 There are bike lanes in Detroit. I saw none of them on my route through the suburban communities. In Detroit most of the houses I passed were one of a kind. In the suburbs, most were simple brick ranch or frame homes. However, some of the suburban streets I rode did have a few 1920s Arts & Craft style homes. 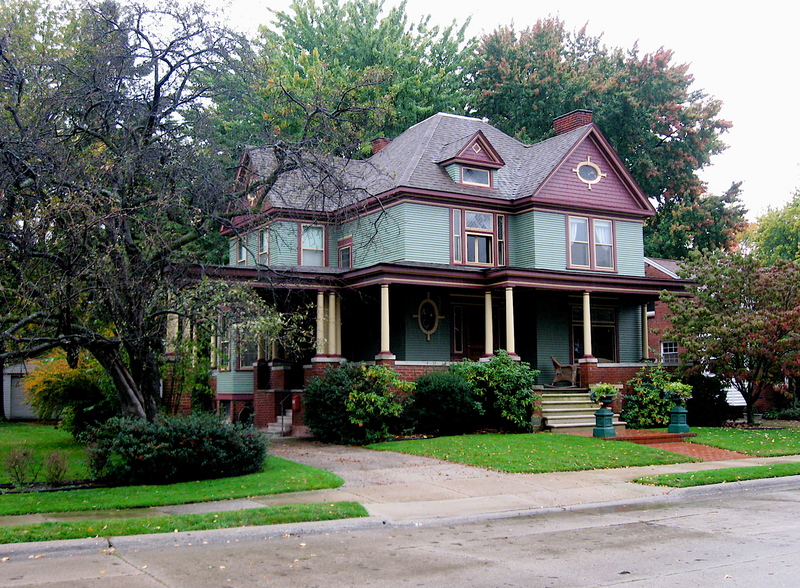 On one street in particular, there is a gorgeous restored Victorian era house. In the suburbs I saw the same kids, morning after morning, waiting for school busses at the same intersections. In Detroit, I saw the same city kids, day after day being picked up by taxis or jumping into their parent’s car to be driven to school. In the suburbs the teenagers I passed gave a wave or completely ignored me. In Detroit, they stared at me with a tough street wise look. 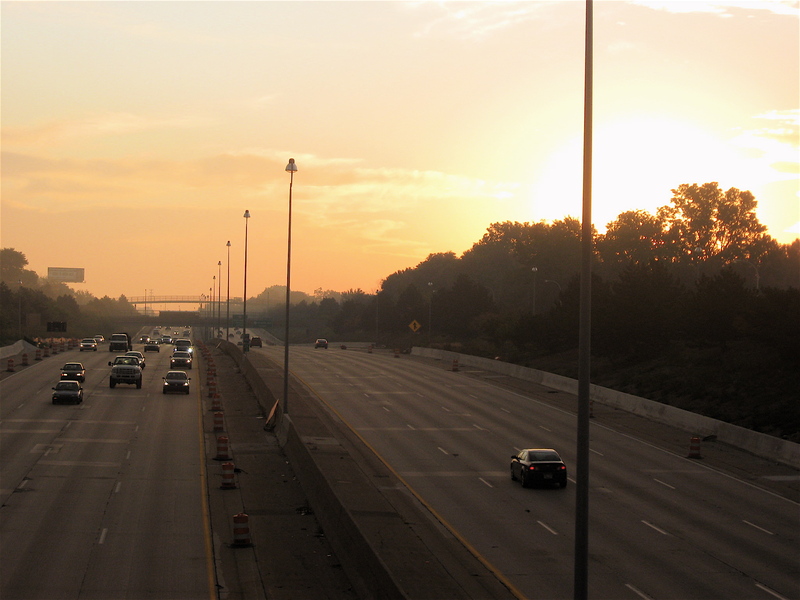 In Detroit’s early morning light, I had raccoons cross in front of me. On the ride home I saw and heard pit bull dogs behind fences. In the suburbs, I saw squirrels darting by with their tails high in the air, and spaniels behind fences. In the suburbs, most of the streets were quiet (not Groesbeck with its many semi-trucks), and general public transportation buses were not around. 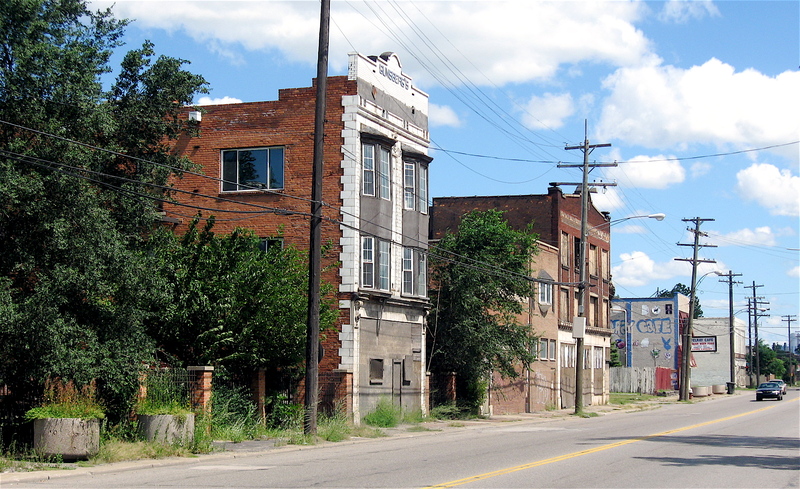 In Detroit, the streets were noisy with car stereos blaring, sirens in the distance and buses with diesel-powered engines cruising by leaving black smoke in their wake. 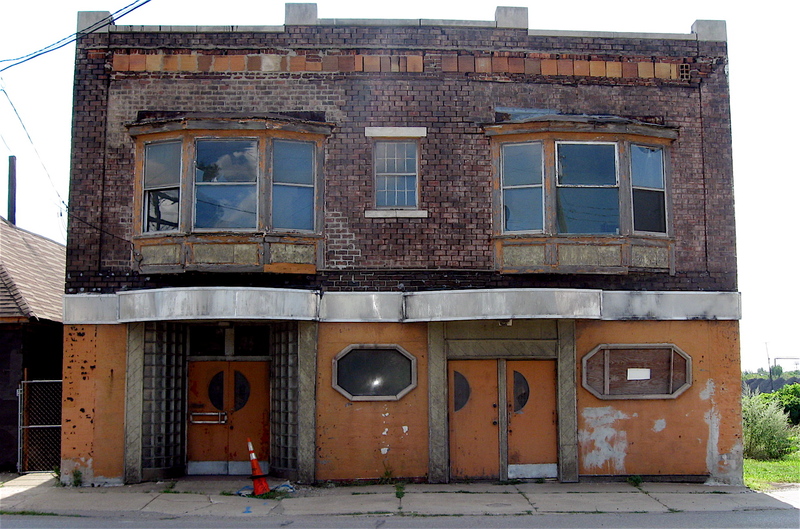 Many of Detroit’s neighborhoods have seen better days. 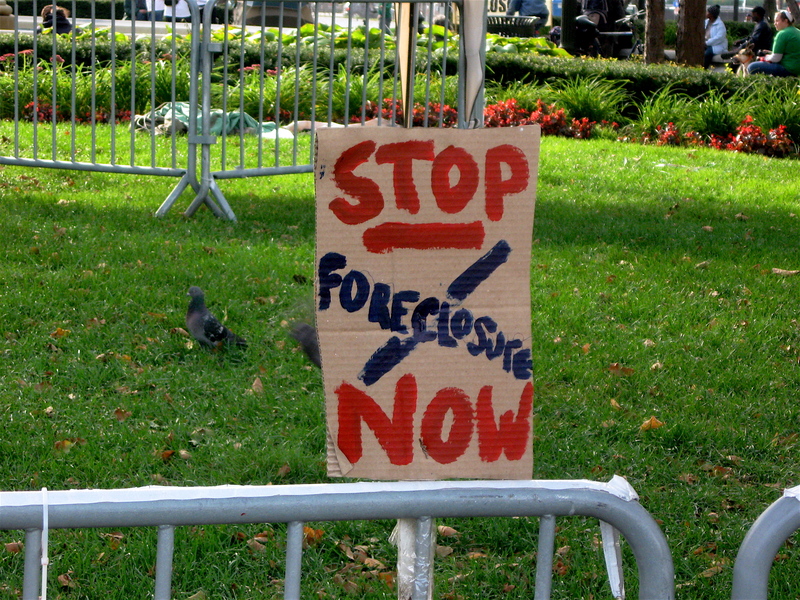 With so many people migrating to the suburbs and beyond over the past 50 plus years, urban blight has slowly crept in. Unfortunately, many of the vacated residential structures have been stripped of windows, pipes, bricks and other structural elements and eventually set on fire. The mass abandonment has left the once beautiful streets permanently disfigured, with unsightly open structures and weed choked lots, where houses or classic apartment buildings once stood. Pedaling throughout the city’s neighborhoods, it’s disheartening for me to see the extraordinary craftsmanship and unique architecture of the one-of-a-kind, custom homes lost forever. 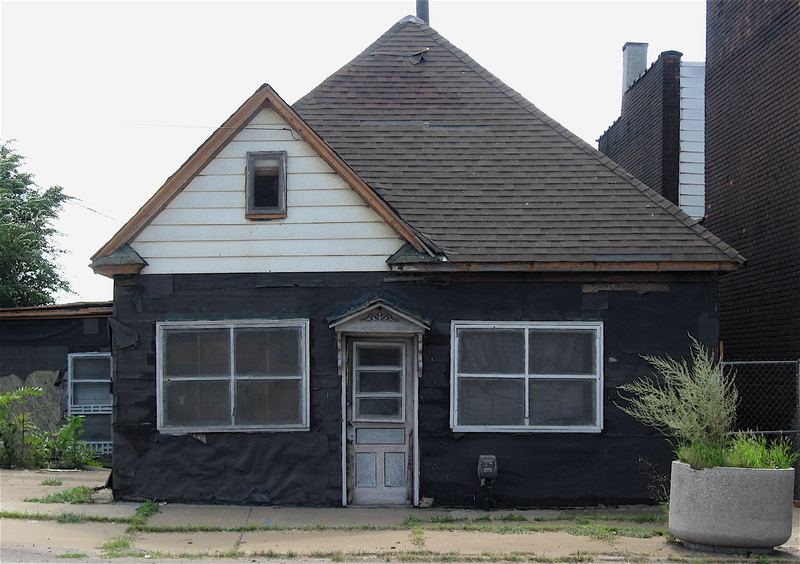 Unfortunately, I’ve seen way too many of these disgusting, burnt out dilapidated homes spread across this city. After a while, they all tend to look-alike. 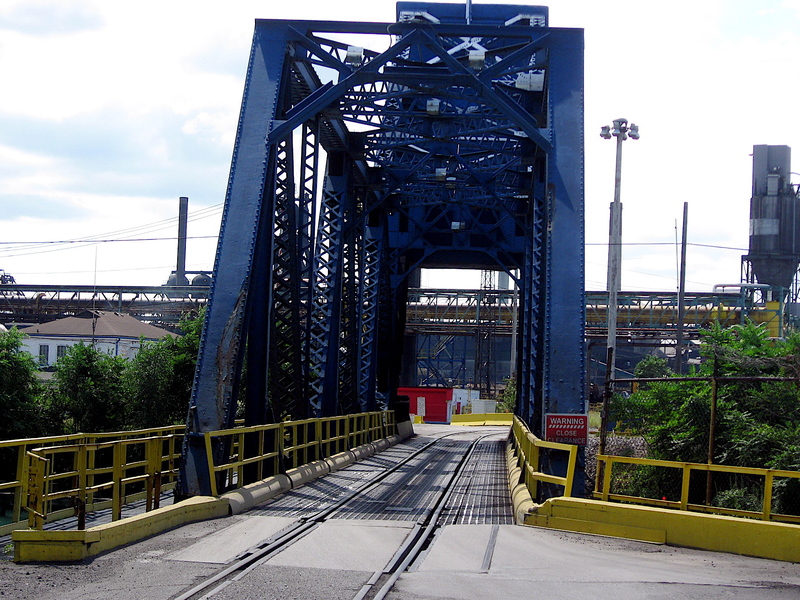 However, on occasion one of the distressed structures will catch my eye. Not because of their run-down condition or the blackened, ashen remains strewn about, but the interesting artifacts that have survived the devastating fire. I came across one of particular interest just the other day. The former home I spotted was now a dark pile of charred wood, bricks and other debris from a recent fire. It was all but obliterated, with the exception of one white wall. That particular wall supported a gorgeous, arched plaster doorway that was still standing, unscathed. By the looks of it, I assumed the wide, decorative opening led to a decent sized living room that is now long gone. Round plaster columns edged the opening of the ornate plaster wall and anchored its graceful, flowing arch. The eight foot wall stood proudly, as a small tribute to its builder, in defiance of the fire that once surrounded it. The wall looked untouched by the fire and smoke and, remarkably, it was not blackened or buckled by the heat or blown apart by high-pressure fire hoses. Strangely enough, it was 90 percent intact, with only small chunks of the plaster broken away. Looking at the ornate plaster wall reminded me of a picture frame. Gazing through its smooth, clean opening, I saw a few blackened timbers from the fire, trees and other plants from the empty lot next door. It literally framed a small, modest part of Detroit that I would, in all probability, never see. So I got to thinking; wouldn’t it be cool if some enterprising individual could salvage this plaster wall (or frame), mount it to a trailer and tow it around the city for use as a street side photo frame? Think about the possibilities: riders framed at a bus stop, on church steps, or at a window in a small barbeque restaurant late at night. Street musicians would appear as if they were on stage. Graffiti wall art would be framed in a museum setting for all to see. The possibilities and settings are endless in this city. 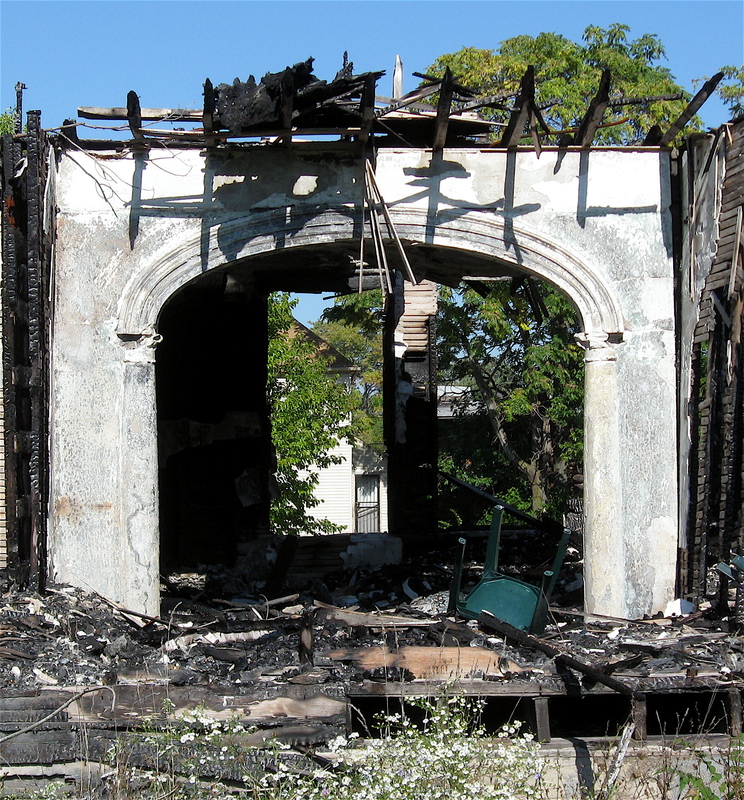 This interesting little fragment of a burnt out home could frame Detroit in a new, fresh way. What do you think? Poor old Delray has seen better days. 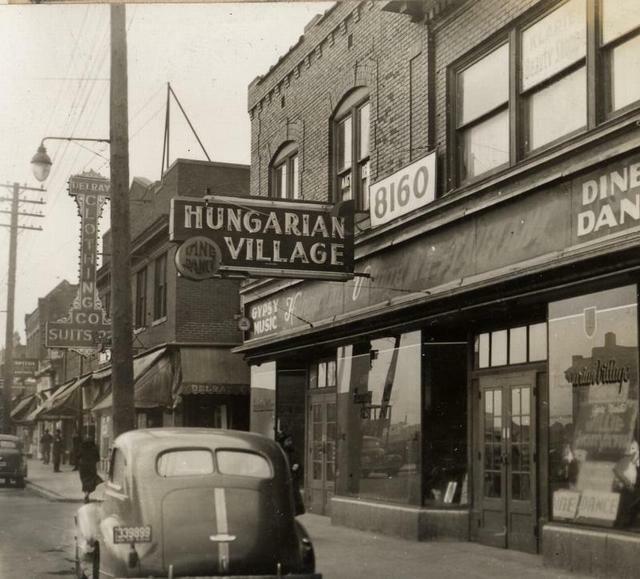 At its peak in the 1930s, the Delray neighborhood of Southwest Detroit numbered over 23,000 residents, and pictures from that era show vibrancy and activity that is only imaginable today. 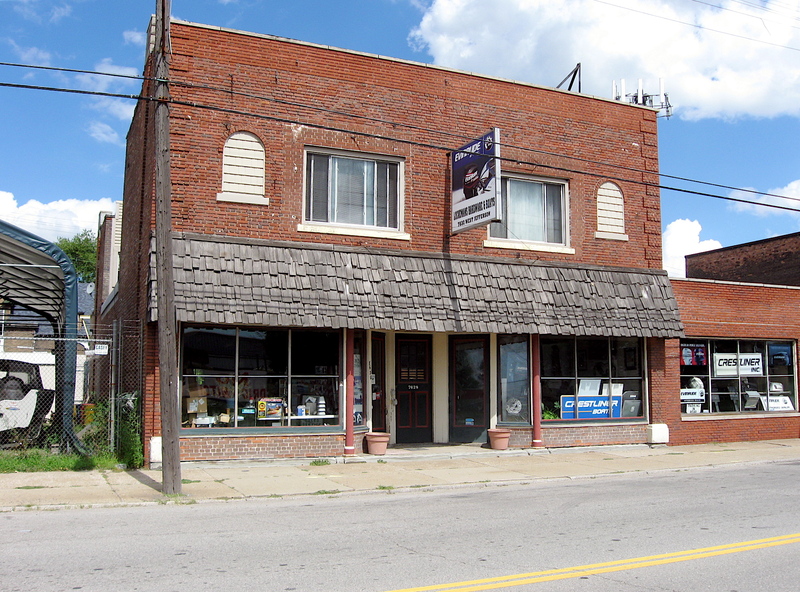 Currently, that same neighborhood has about 2,700 residents, and many of the once beautiful Art Deco commercial buildings lining West Jefferson Avenue are now boarded and in need of major repair. On my recent ride through the area, I noticed most of the residential side streets have a limited number of occupied, old frame homes that seemed to have taken on an ashen hue. It was clear to me that at one time, those same streets were once jammed with houses where immigrants from Eastern European countries such as Armenia, Hungary and Poland once lived. Unfortunately, most of the area reminded me of a ghost town. Not a western ghost town with tumble weeds blowing about, but an urban, industrial ghost town tucked into a small, isolated section in a vast city that covers 140 or so square miles. However, there are subtle changes happening in Delray today. These are positive and noticeable changes to the landscape, as compared to a year ago when I last rode my bicycle through that bruised chunk of Detroit. 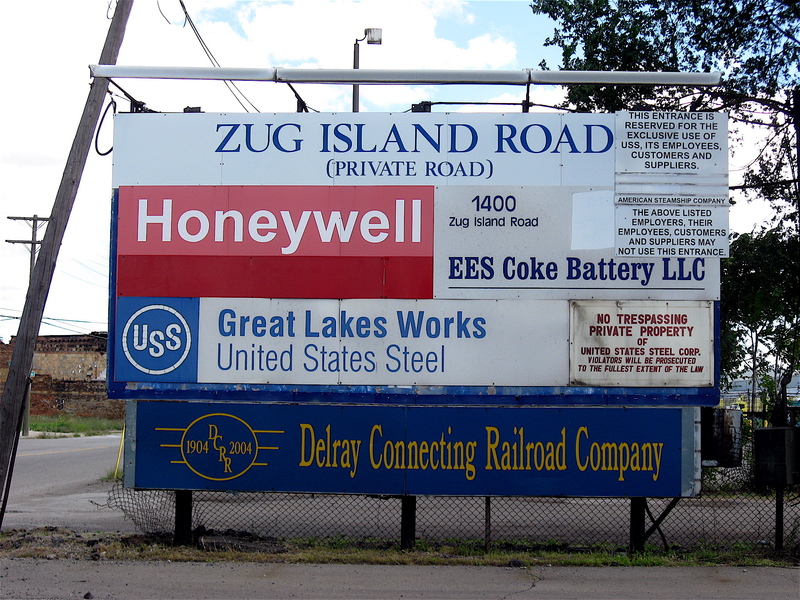 Sure, heavy industrialized Zug Island, at the mouth of the Rouge River just below Jefferson from Delray, is still home to huge steel mills that have operated there since the early 1900s. 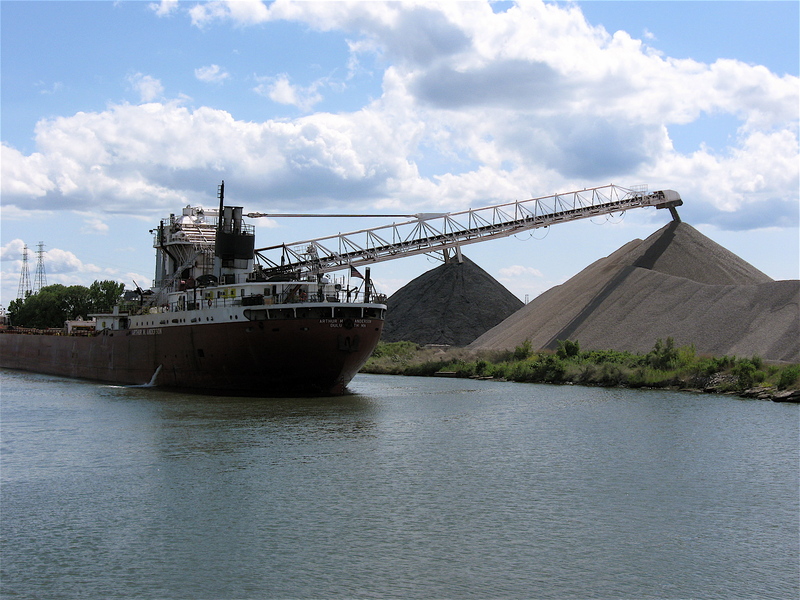 Thousand foot ore carriers and train engines pulling hopper-cars still work their way to the island to feed raw materials such as coal, iron ore, coke and other elements to the mills in order to keep them humming along. The Detroit wastewater (sewage) treatment plant, the largest of its type in the country, continues to operate around the clock, purifying our waste water before it is released into the Detroit River. Many of the heavily, burned out and wide open blighted commercial buildings I saw just last year lining W. Jefferson (the main road through the old village of Delray) have been knocked down and carted away. However, a few of the secured classic Art Deco commercial buildings from the boom times of the 1930s still survive; waiting patiently for new life that will, no doubt, never come. I was also encouraged to see the few remaining viable businesses from last year’s bicycle journey, such as a hardware store and a tavern or two still holding on. 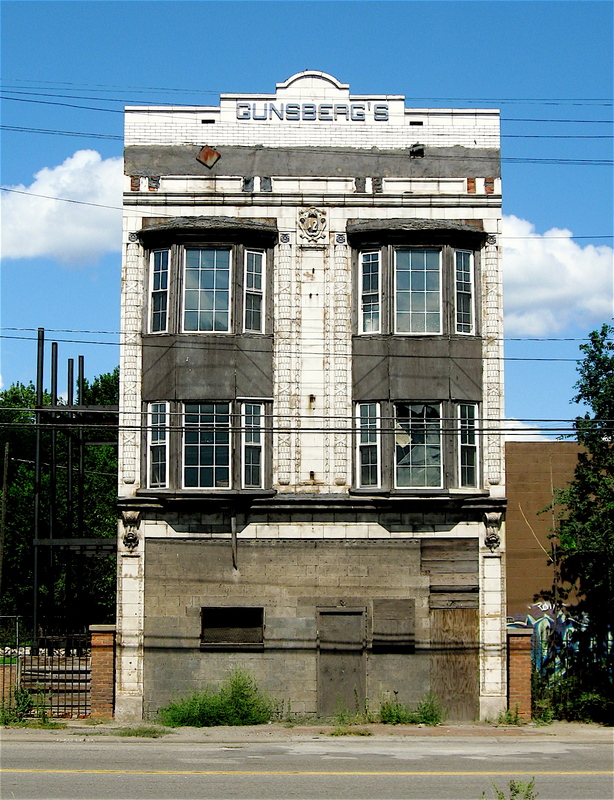 It’s a remarkable feat, considering the surrounding abandonment of the commercial strip. Plus, the once heavily populated residential streets are only a remnant of what they once were, with many open fields having replaced row after row of small frame houses that are today nothing more than an image in a photograph. Even the air quality seems to be better. I remember a time when chemical and other industrial smells overwhelmed the area, but much of that throat-drying stench is gone. Nevertheless, the combined aromas of the wastewater plant and the chemical odors of Zug Island can still stimulate the sense of smell in unusual ways. Rambling through poor old Delray is far from a casual stroll through a rose garden in full bloom.